The Sentinel Corrosion Shield is a rigid mechanical protection device which encapsulates the cable gland, providing a high integrity seal. The Sentinel seals the interface between the equipment and the gland for both threaded and clearance holes. The robust outer environmental seal engages the outer sheath of the cable, providing an exceptional barrier to moisture, dust, corrosive substances and chemical agents that may attack the CMP cable gland. 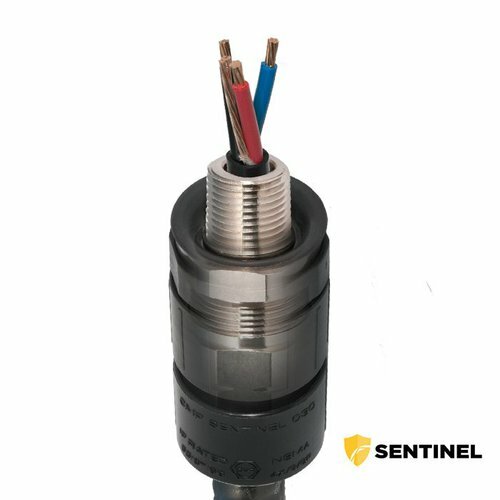 As well as providing a practical alternative to stainless steel connectors, the Sentinel Corrosion Shield reduces the need for periodic inspections. When required, inspections can be easily undertaken, facilitated by easy disconnection and re-connection of the corrosion shield to inspect the gland.